British Field Marshal who served in many campaigns, including the Crimea and Indian Mutiny. ALS. 2pp. Royal Hospital, Kilmainham, Dublin. 22nd August 1895. To [William] Woodall. Together with a fine, large contemporary portrait photograph. "You have paid me a great compliment in your letter of congratulations, and I prize very much the kind and flattering things you say in it. I always found in you a most sympathetic colleague who always had the interests of the army and therefore of the country thoroughly at heart. May I always have as kind and genial a Financial Secretary to work with and may you always regard me as a friend." 8vo. Approx 7 x 4.5 inches. 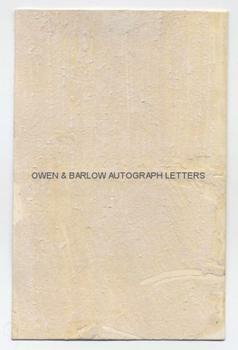 Mounting residue on verso of integral blank leaf, else fine. 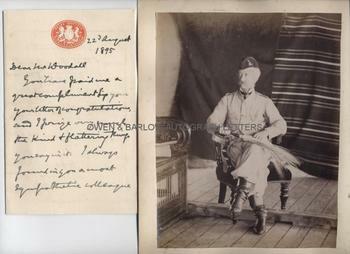 The photograph is a very handsome 19th century gelatin silver print, showing Sir Garnet Wolseley in full undress uniform and riding boots, seated with a fly whisk resting on his knees. It appears to be taken in a MILITARY tent whilst on active duty and a pencil note on the verso suggests it was taken in Egypt. It measures 8 x 6 inches (excluding mount) and is laid down on card. It is in fine condition. Both the letter and the photograph are from a 19th century collection made by the radical Liberal M.P., William Woodall. Woodall was Financial Secretary to the War Office in Gladstone's government and had worked closely with Sir Garnet Wolseley whilst he was Quartermaster-General. 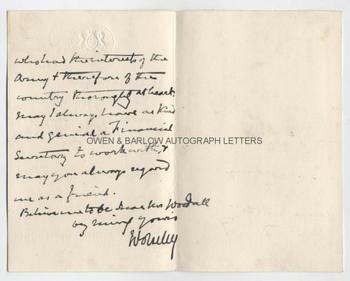 Wolseley had been appointed Commander in Chief of the army by the Conservative government in 1895 and it is no doubt this appointment that drew Woodall's congratulations. 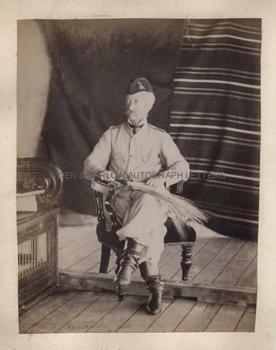 The photograph was almost certainly taken sometime between 1882 and 1885, when Garnet Wolseley was serving with distinction in Egypt and the Sudan, where he had supressed the rebellion at Tel el-Kebir and had commanded the expedition for the relief of General Gordon at Khartoum.